For all the debate, speculation, and controversy that has surrounded the hoped-for growth of the so-called “clean” economy and “green jobs” one thing has been in pretty short supply: facts. For all the talk of its alluring promise, the clean or green economy remains an enigma, in large part due to the continued absence of standard national definitions and data. 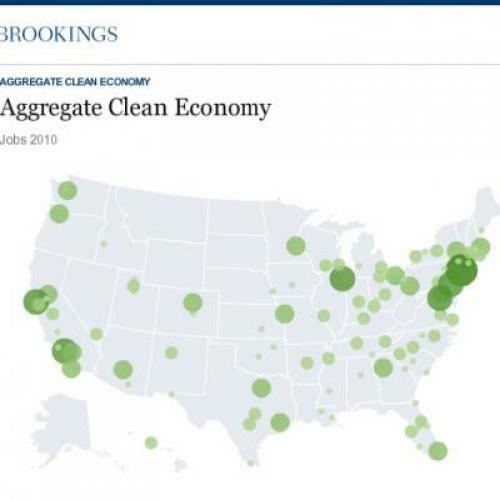 Today that changes with a new report assessing the current nature, size, and growth of the “green” or “clean” economy in U.S. regions. Developed by the Brookings Metropolitan Policy Program in partnership with Battelle’s Technology Partnership Practice, our report and its underlying database--entitled “Sizing the Clean Economy”--are not perfect accountings. Still, I think you will agree they offer a compelling new national and metropolitan look at a sector of the economy that has remained at once an important aspiration and a frustrating enigma. Do look over the report; view the live webcast this morning (Wed. 9 a.m. Eastern) of our release discussion; and check out the special interactive mapping tool we’ve developed--all of which are aimed at shedding further light on the geography of this hard-to-assess sector. Over the last 18 months we’ve developed and analyzed a detailed database of establishment-level employment statistics pertaining to a sensibly defined assemblage of low-carbon and environmentally oriented industries in the United States and its metropolitan areas. Covering the years 2003 to 2010 for larger U.S. metros, the resulting information provides a new source of timely information that is both consistently applied so as to allow cross-region comparisons but detailed enough to be of some use to inform national, state, and regional leaders on the dynamics of the U.S. low-carbon and environmental goods and services super-sector as they are transpiring in U.S. regions. To be sure, localized drill-downs in particular places may capture a fuller profile in some regions. But overall, our new information provides what we believe is a plausible, useful, first-of-its-kind measure of the size and growth of the clean economy as it is occurring in the nation’s 100 largest metropolitan areas. What is more, our definition, approach, and data have been structured as much as possible to anticipate the Bureau of Labor Statistics’ own forthcoming “green jobs” count, due next year at somewhat broader levels of geography. It’s time that all U.S. regions begin to have access to some at least rough order-of-magnitude facts about the size and shape of their clean economies.